Did you know that most frogs have teeth? Seriously, the majority of frogs have a ridge of very small cone teeth around the upper edge of the jaw, called Maxillary Teeth. 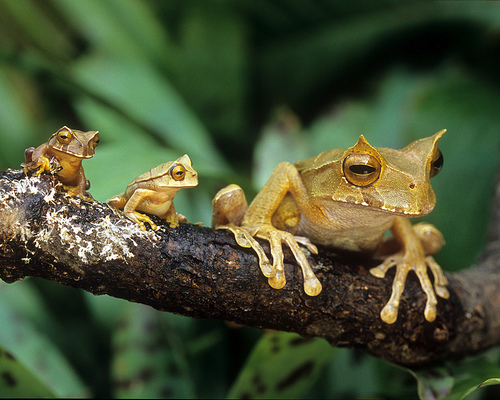 Frogs often also have what are called Vomerine Teeth on the roof of their mouth. The so-called "teeth" are not used for chewing but to hold the prey and keep it in place till they can get a good grip on it before squashing their eyeballs down to swallow their meal. However, only one species of frog has teeth on their lower jaws too - Gastrotheca guentheri - and new research into this unusual species now sees evolutionists reassessing the laws of nature. "The loss of mandibular teeth in the ancestor of modern frogs and their re-appearance in G. guentheri provides very strong evidence for the controversial idea that complex anatomical traits that are evolutionarily lost can re-evolve, even after being absent for hundreds of millions of years"
Dr. Weins suggests that because the frogs have always had teeth on their upper jaw, the "mechanisms for developing teeth" have always been present, they simply evolved lower teeth in a different manner than their ancestors. In the last decade, scientists have identified and debated several attributes that have apparently "re-evolved" over time including stick insect's wings, coiling in limpet shells, larval stages of salamanders and lost digits in lizards.